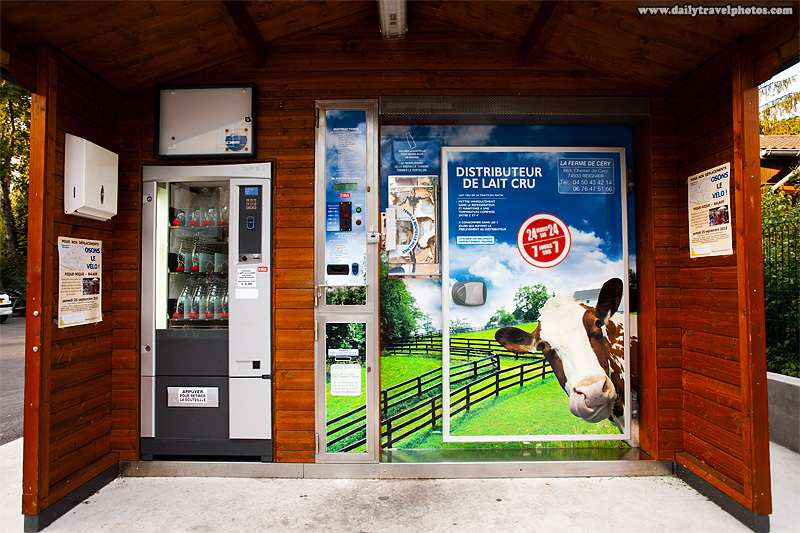 An automated milk vending machine housed in a rustic shed. If you can, please forget the terribly distasteful image of the automated pizzeria from two days ago. Instead, feast your eyes on the ingenuity of French farmers and/or business-folk. We're talking about the availability of fresh whole-milk, 24 hours/day, people! In case you've left your empty bottle at home, the left portion of the shed houses an empty milk bottle dispenser. Slip €0.20 into the slot to retrieve an empty container. Step one is complete. Move over to the machine on the right. €1 buys a liter of milk while €0.50 spits out a half liter. Slip in your desired coinage, open the small metal door (dead center in the photo, just above the image of the tree), hold your empty bottle under the nozzle then voila, a slow stream of milk oozes into your possession. While your bottle slowly fills to capacity, a disturbingly realistic "moo-ing" sound emanates from within the machine, giving the illusion that a cow is discharging the contents of her udder for your immediate drinking pleasure! I've never drank milk regularly, however, with the discovery of this milk vending machine, I've come to drink it religiously, if only to make another giddy run to restock my bottle. 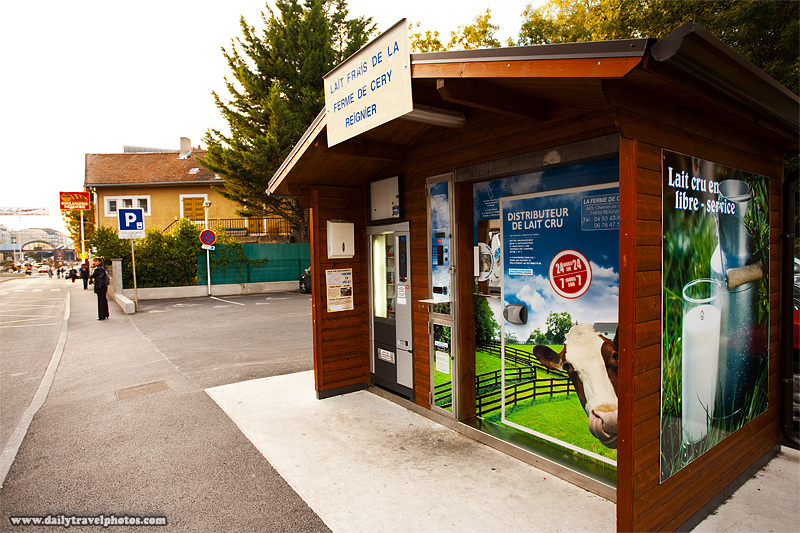 An automated curbside milk vending machine housed in a rustic shed. In case you were curious, the milk inside the machine is replaced on a daily basis and yes, the machine is as much of a joy to use as you are imagining. If only they'd used a picture of a cow that isn't licking the inside of its nostril.